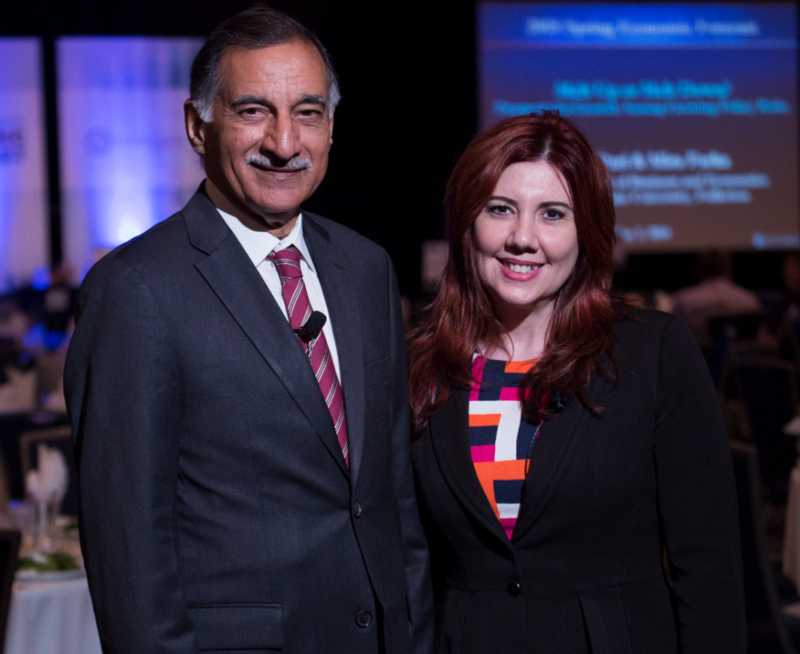 In light of recent stock market volatility and the ongoing expansion, Anil Puri, director of the Woods Center for Economic Analysis and Forecasting, and Associate Professor of Economics Mira Farka, Woods Center co-director, presented their annual spring update of the Economic Outlook and Forecast at the Hotel Irvine on May 3, examining the state of the global, national and local economies. After several years of relative tranquility, especially in 2017, financial markets have been caught in increased volatility in recent months, which has dominated headlines despite a continuing economic expansion resulting in some of the highest employment rates in the post-World War II era and a historically long slog of continuous GDP growth. “2017 was a remarkable year. Stock markets around the globe soared, volatility was at historical lows, inflation remained subdued, and monetary policy continued to remain accommodative across the world,” report Puri and Farka. “Alas, 2018, has ushered in a dourer mood. Retail sales slumped for the third straight month in February, vehicle sales have plateaued, construction took a step back earlier this year and home sales continue to struggle. More importantly, market volatility is back with a vengeance as if making up for lost time last year when it was conspicuously absent,” they say. While some recent point changes on the Dow Jones Industrial Average have been dramatic, such as the record-breaking 1,175.21-point plunge on Feb. 5, these declines are relatively common historically when taking into account the much more modest percentage drops due to the high values of today’s share prices. Puri and Farka note a number of concerns that have worried investors, including fears of inflation, geopolitical trade shifts wrought by the Trump Administration and recent troubles in the e-commerce sector. Among the signs for optimism are consumer and business sentiment remaining at all-time highs, rising business investment, the bounce back in the real estate market from the depths of the Great Recession, rises in wages and continued tightening in the labor market. The recovery from the Great Recession, once a tepid upward trend following the most ferocious downturn since the Great Depression, has since blossomed into a robust expansion that will set records for the longest growth spurt since World War II if it continues until at least June 2019, which Puri and Farka anticipate. They called for a 2.8% rise in GDP this year and a 2.9% jump in 2019, buoyed by continued strong fundamentals and fiscal stimulus. While market volatility might be uncomfortable when compared to the recent calm, this does not necessarily equate to hard times on the horizon, though Puri and Farka expect a bumpy ride in the markets over the near-term. Looking at trade tensions, Puri and Farka take a more positive view than the consensus, noting that China’s trade policy has been less than fair and the tariffs proposed by the Trump Administration could ironically result in freer and fairer trade with Asia’s leading economic superpower. NAFTA renegotiations also have the potential to result in a needed modernization. Taking a longer view, the growing federal debt stands as a leading threat, with meaningful entitlement reform unlikely given the current political climate. Irregularities in the data provided by the California Employment Development Department notwithstanding, the Southern California labor market continues to move closer to full employment, with the statewide unemployment rate declining to 4.7%, the lowest since the 1980s. Unemployment in the Southern California region is also 4.7%, which is the lowest such figure in more than a decade. Though slowing down from the growth rates of recent years, job growth has continued in all counties of the region, including the Inland Empire, where the jobless rate has declined to a historically impressive 5.1%. 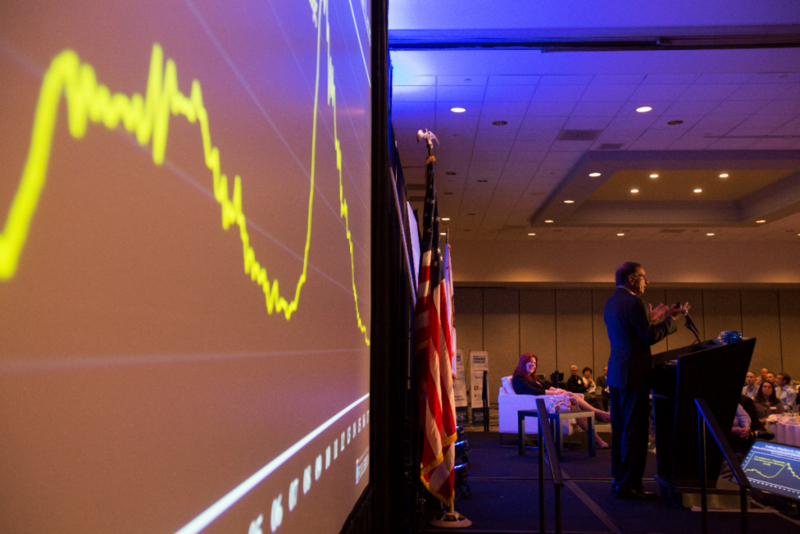 Looking at Orange County specifically, a relative slowdown in population growth, high housing values and increased homelessness have captured the headlines. Puri and Farka noted that these factors are relatively interconnected. While the rate of housing price increases may moderate, an appreciation of 5% this year and 4% in 2019 is still expected.